Getting a cold is nobody's cup of tea. If you're sick often, you might be considering natural remedies for cold prevention or ways to reduce the severity of your illness. Vitamin C is often called the immune boosting vitamin, but you may be wondering if science backs up claims that vitamin C prevents colds. Most reputable sources say vitamin C doesn't prevent you from getting a cold, but in some cases vitamin C may be useful in cold prevention. The University of Maryland Medical Center says vitamin C doesn't cure colds, but the essential vitamin does appear to reduce the risk for colds in extreme athletes, such as marathon runners, skiers, soldiers. A 2013 study published in The Cochrane Database of Systematic Reviews and MedlinePlus also confirm vitamin C appears to be useful for cold prevention in people exposed to severe or extreme forms of exercise. In addition to extreme athletes, other population groups might be able to steer clear of colds from taking vitamin C. Mayo Clinic says that while in most cases vitamin C doesn't prevent colds, it may be beneficial for people at high risk of developing them like children at day-care centers during winter months. Likewise, the Office of Dietary Supplements suggests taking vitamin C may useful for people who aren't getting enough of this nutrient in their diets, elderly adults, and chronic smokers (smoking depletes vitamin C in the body). While research doesn't back up the claim vitamin C prevents colds in the general population, there do seem to be benefits of taking it for colds. MedlinePlus says vitamin C appears to reduce the length of time colds last in some people, and the University of Maryland Medical Center suggests vitamin C may reduce cold durations by about one day. 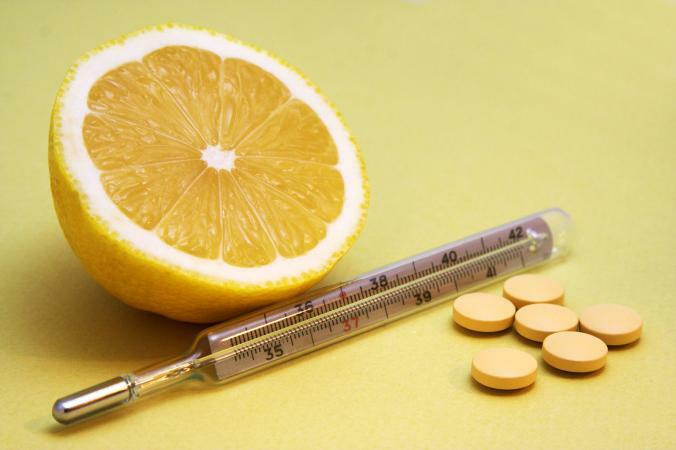 Mayo Clinic says taking vitamin C supplements before symptoms occur may shorten the duration of cold symptoms. However, the Office of Dietary Supplements notes taking vitamin C after cold symptoms occur doesn't affect the severity or the duration of your cold. How Much Vitamin C Is Effective? Getting plenty of vitamin C from fruits and veggies daily is the first step to staying healthy. But, to reap the benefits of vitamin C's effects on colds, you'll likely have to take a supplement. The University of Maryland Medical Centers suggests taking 500 to 1,000 milligrams of vitamin C each day (in doses of 250 to 500 milligrams taken twice daily with meals) to notice effects on colds from vitamin C.
The Office of Dietary Supplements says taking 250 to 1,000 milligrams daily appears to reduce colds by 50 percent in extreme athletes (marathon runners, skiers, and soldiers), and the same dosage may be useful for elderly adults and smokers. The 2013 study in The Cochrane Database of Systematic Reviews reports cold durations were shortened by 18 percent in children who took 1,000 to 2,000 milligrams of vitamin C daily. MedlinePlus says taking the same dosage (1,000 to 2,000 milligrams per day) of vitamin C to reduce cold durations is an amount that's safe for most people. It won't hurt to take vitamin C if you've been exposed to cold germs, although hand washing is your best preventative. If you've been exposed, you may take 1,000 to 2,000 milligrams each day if you wish, although research suggests it may only be helpful for prevention in vulnerable individuals. Getting too much vitamin C from supplements can cause negative side effects or be dangerous. The tolerable upper intake level for vitamin C is 2,000 milligrams daily, which means dosage is the maximum safe amount recommended for most healthy adults. Taking more than 2,000 milligrams per day could cause upset stomach, diarrhea, and gas. If you're pregnant, the University of Maryland Medical Center says don't take more than 1,000 milligrams of vitamin C daily unless your doctor okays it, and people with sickle cell anemia, thalassemia, diabetes, and those who take chemotherapy medications shouldn't ingest high doses of vitamin C supplements (and should check with their doctor first). Vitamin C supplements, especially high doses, aren't safe for everybody, which is why it's important to always keep your doctor informed about supplements you're taking. MedlinePlus warns to avoid vitamin C supplements if you have kidney disease, and the University of Maryland Medical Centers says people with hemochromatosis (a condition that causes a buildup or iron in the body) should also avoid such supplements. Vitamin C can interact with certain medications, which is why it's so important to always keep your doctor informed. For most people, vitamin C supplements won't prevent colds but may slightly lower the duration or severity of the symptoms. Avoid taking more than 2,000 milligrams of vitamin C from supplements daily, and always check with your doctor first, especially if you have medical conditions, are pregnant, or are taking medications.